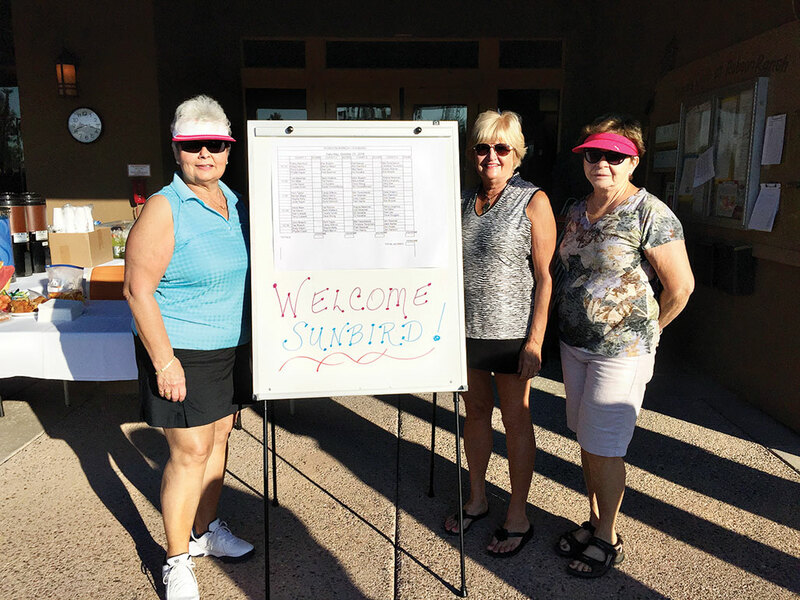 Judy Huber, Jeri Srenaski and Kay McMurray help out with the tournament. The Tennis Club at Robson Ranch kicked off the fall season hosting a one-day tournament against SunBird Community of Chandler. Last year the last weekend of October saw chilly weather as we traveled to SunBird to play in the tournament. Hot coffee and light jackets warmed us up before we hit the courts. This year the last weekend of October saw a much different weather pattern. At 9:00 when the first teams took the courts, the temperatures hovered around 75 degrees; but by the time the afternoon matches got underway, players were competing under a record-breaking 96 degree sky! Although the hotter temperatures were challenging, the matches were still quite competitive. Several of the matches ended with a third set Koman tie-breaker, and a few matches had not only a 7-point set tie breaker but also a 10-point third set tie breaker! When all was said and done, Robson won the tournament by a score of 11-9! Great tennis matches! A big thank you goes to Betty Murphy and the maintenance crew for getting the courts cleaned and ready, setting up chairs and tables, and arranging the ramada area. Thanks to the restaurant crew who provided the coffee, water and Gatorade. The Tennis Club provided the main course, but many thanks to the players who provided the muffins, coffeecakes, side dishes and desserts as well as those who participated in the match play. Lastly, thanks to our volunteers: Jeri Srenski, Kay McMurray, Jill Stettler and Judy Huber. Your help was greatly appreciated by the chairpersons of the tournament!